A delegation of American business leaders with lobbying ties to relatives of a top Obama administration adviser wrapped up a four-day tour in Egypt aimed at laying the groundwork for increased economic cooperation on Tuesday, as violent rioters stormed the U.S. Embassy in Cairo. Senior State Department officials accompanied more than 100 executives from 50 American companies on the trip, which included high-level powwows with Egypt’s Muslim Brotherhood-backed president, Mohamed Morsi, and other Egyptian officials. Among the Obama administration officials present on the tour, which was jointly sponsored by the State Department and the U.S. Chamber of Commerce’s Egyptian affiliate, was John Podesta, a senior adviser to the Secretary of State and former Clinton administration official who founded the liberal Center For American Progress. Ten of the 50 companies present on the tour have been clients of lobbying firms separately run by Podesta’s brother and sister-in-law, leaving some observers wondering what role the Democratic insider may have played in determining which companies earned slots on the potentially lucrative junket. One of the firms, The Podesta Group, is operated by Tony Podesta, who is John’s brother. The other, Heather Podesta + Partners, is run by John’s sister-in-law. During the several-day jaunt, business leaders from the finance, defense, and aerospace sectors, among others, were exposed to investment opportunities in Egypt’s burgeoning public and private sectors. 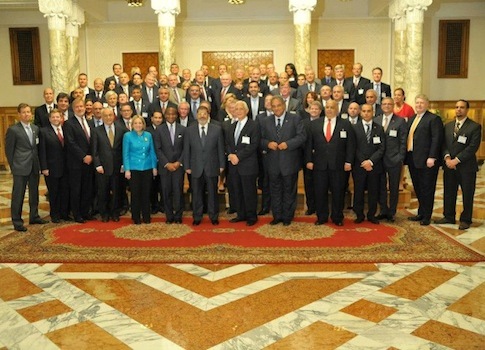 "The group, which included representatives from 50 leading American companies and top administration officials, traveled to Egypt to deliver a simple message to the nation’s new government: Egypt is open for business, and the U.S. business community is ready to invest," according to an account of the trip on the Chamber of Commerce’s website. Ten of the most prominent companies to participate in the trip have been or are currently represented by either The Podesta Group or Heather Podesta + Partners, highlighting the close ties between the Obama administration and Democratic-leaning lobbying outfits. The companies whose representatives John Podesta accompanied to Egypt have collectively spent millions on firms run by his brother and sister-in-law, records show. They include Boeing, Raytheon, Eli Lilly and Company, Johnson and Johnson, Lockheed Martin, Credit Suisse, Google Inc., Oracle, Pfizer, and General Electric. None of the companies commented on the trip when approached by the Free Beacon. Lockheed Martin, a defense contractor that works closely with the U.S. government, has paid The Podesta Group more than $2.2 million since 2004 to lobby both Congress and the Obama administration on a range of issues, records show. The Podesta Group has pushed lawmakers to endorse various appropriations measures that would benefit Lockheed, according to records. Boeing, also an aerospace group, has been a partner of both The Podesta Group and Heather Podesta + Partners, according to records. Since President Obama entered office in 2008, Boeing has spent $840,000 on The Podesta Group’s services, relying on the firm to lobby in favor of lucrative defense appropriations at the White House and on Capitol Hill. From 2007 to 2009, Boeing paid Heather Podesta’s firm $760,000 to lobby the administration on multiple defense issues, including the implementation of a missile defense system, records show. Raytheon, a prominent aerospace company, also has been a client of both Podesta family firms, spending a combined $340,000 since 2008 on a range of lobbying services. Heather Podesta + Partners, for example, has monitored congressional legislation pertaining to the foreign sale of arms on Raytheon’s behalf, records show. Another of Heather Podesta’s clients on the government-endorsed Egypt jaunt was Eli Lilly and Company, a healthcare organization that has paid her lobbying group more than $1.1 million since 2008. Johnson and Johnson, which also has a stake in the health industry, has paid The Podesta Group $140,000 since 2011 to lobby lawmakers on legislation pertaining to certain medical devices. Credit Suisse Securities, a firm that has been tied to Iran, also hobnobbed with Egyptian officials during the trip. It has employed The Podesta Group since 2009. The company, which has been a Podesta Group client since 2009, came under scrutiny last month for paying senior White House adviser David Plouffe for a speaking engagement. Internet search giant Google has spent more than $3 million on The Podesta Group’s services, utilizing it to lobby the White House on issues such as cyber security and online privacy, according to records. Oracle, Pfizer, and General Electric also count themselves among The Podesta Group’s clientele, utilizing the firm to lobby on a range of high profile issues. While details about the trip to Egypt remain sparse, the business leaders Tuesday issued a joint statement with U.S. Chamber of Commerce discussing their goals. "We believe in the critical importance and mutual benefit of investing in Egypt now—particularly in its talented young men and women," the statement reads. "With a newly democratically elected Egyptian government now in place, we believe that it is critical to take concrete steps to broaden and to deepen the Egyptian-American economic relationship." The statement offered several policy recommendations to the U.S. government, but did not mention Tuesday’s violent confrontation at the American embassy in Cairo. This entry was posted in Politics and tagged Boeing, Egypt, General Electric, John Podesta, Lockheed Martin, Middle East, Mohamed Morsi, Muslim Brotherhood, Podesta Group, State Department. Bookmark the permalink.